If you follow me on Instagram (@shannasaidso), you know I can sometimes get a little carried away with "outfit of the day" selfies. I am here to say that I am #sorryimnotsorry for posting what I wear every other day or so. I think it's fun to share fashion and ping pong ideas off of one another. I know that I have gotten some serious fashion inspiration from other people that I follow. For the past few weeks or so, I have taken a handful of said Instagram outfit selfies and created a style board from what I wore on a particular day. I have gotten some genuine feedback, so I will continue to do these posts to help inspire other women with their style and wardrobe. I sincerely hope you enjoy these posts as much as I do writing and creating them. So, let's get to styling, shopping and playing virtual dress up! This floral top from ModCloth is hands down one of my favorites as you can see here and here. Nope, not getting paid from ModCloth to say this. It's my free willed opinion. It's long enough for leggings, casual enough for shorts and can be paired with a skirt for work. Something that did get sent to me was the Giando Massi striped tote. I have carried it on styling appointments, travel excursions and for simple everyday use. The fabric and leather is worth every single cent. So, there ya have it. A little of this and a little of that for a relaxed floral spring look. What are some of your favorite pieces that you have been wearing non-stop as of late? Please don't forget to vote for me. I am in the running to be Wallis' 1st U.S. Fashion blogger. I love these types of posts... both for outfit inspiration and discovering new places to shop online! That tote bag is gorgeous! I love the instagram selfies! It's inspiration at my fingertips! That modcloth top is super cute and I love the jewelry you used with it. That top! I WANT IT! Such a pretty look! Love this combination!! I'm not a huge floral fan, but I LOVE that top! Looove that tote - and outfit as per usual!!! Such a cute look. I really like the darker floral print of your top! And keep on with the instagram outfit selfies, I love 'em! such a cute top! and i love your bag! That bag is the cutest...I love anything striped! I love floral because you can dress it down or wear it to work. Plus, it's so cute! This outfit is cute and I could see myself wearing it! I really like that floral top, it's so cute and I bet it's really versatile! You know I have that same tote (in navy) so I'm keeping in mind to pair it with florals! Thanks for the inspiration! I love the red flats! You did a great job with the floral shirt! I'm voting for you daily! I'm sending lots of happy thoughts and sharing your way! Good Luck, Sweet Girl! Nice collage!! I have the same tote in camel!! such a versatile piece! I need to style it soon! Hope you are having a wonderful day! Love this outfit inspiration! I've been super into the color red lately. This is fabulous! LOve yoru outfit and you should always flaunt it!!!! Loving the necklace. I'm hosting a link up next thursday April 11. Show me your favorite Spring trend. Hope to see you there. I love this outfit! Those flats are super cute. And that tote is so fun. I like these kinds of posts so keep em up. 1. I love your OOTD Instas, don't ever stop. You are fabulous. 2. Voted! How are you looking? Winning, I hope! Gosh I need that floral top. It's purty. I like modcloth but not always their prices. I love the Massi tote - I have the same one in black/white! That floral top is so cute! I might have to consider adding it to my closet. You got me hooked on florals & stripes Shanna!! Shanna! I am way bummed! My FB account is all fouled up and I can't go there and vote. Urgh! Hopefully, it will get ironed out. I was hacked and FB doesn't believe me. Have you ever had to communicate with them? Oh, I hope not. I wouldn't wish that experience on my worst bad guy ! I sure hope you can get more votes. Those flats need to be in my closet. I'm getting so excited about this contest!!! When do you find out? And girl, PLEASE keep posting your OOTDs- it helps a sister out, for reals. Modcloth has the best stuff! The floral top is perfect for spring! Great way to share your outfit and share your style with the masses! That purse is really a perfect spring and summer accessory! Don't be sorry for being who you are and doing what you love! Your outfit selfies on IG are awesome...especially this one! 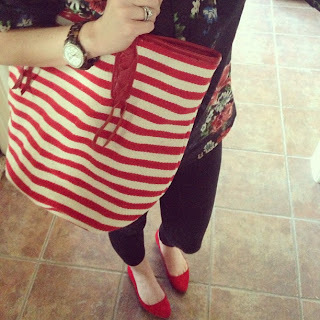 THe stripes on the purse are fun with the floral top! dont apologize for ootd selfies! love 'em! Gorgeous! I'm a huge fan of your OOTD selfiies! I get so excited to see what you have styled for the day! Love this tote and think I might need one too!! I like the breakdown of the outfit. Showing the components makes it easier to replicate!